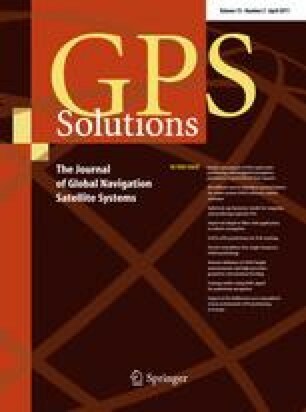 Using dual-frequency data from 36 GPS stations from the EUREF Permanent Network (EPN), the influence of the October 30, 2003 Halloween geomagnetic storm on kinematic GPS positioning is investigated. The Halloween storm induced ionospheric disturbances above the northern part of Europe and Scandinavia. It is shown that kinematic position repeatabilities for this period are mainly affected for stations in northern Europe with outliers reaching 12 cm in the horizontal, and 26 cm in the vertical. These magnitudes are shown to be possibly due to the second-order ionospheric delays on GPS signals, not accounted for in the kinematic GPS positioning analysis performed. In parallel, we generate hourly TEC (Total Electron Content) maps on a 1° × 1° grid using the dense EPN network. These TEC maps do not use any interpolation but provide a high resolution in the time and space and therefore allow to better evidence small structures in the ionosphere than the classical 2-hourly 2.5° × 5° grid Global Ionospheric TEC Maps (GIM). Using the hourly 1° × 1° TEC maps, we reconstruct and refine exactly the zones of intense ionosphere activity during the storm, and we show the correlation between the ionospheric activity and assess the quality of GPS-based kinematic positioning performed in the European region. This work has been supported by the Solar and Terrestrial Center of Excellence (STCE, http://www.stce.be/index.php). The authors also acknowledge the EPN for their data and products (http://www.epncb.oma.be/), the CODE IGS center for their GIM maps (http://www.aiub.unibe.ch/ionosphere/, automatically updated Web site or ftp://ftp.unibe.ch/aiub/CODE) and the Niemegk Observatory for their geomagnetic field data (http://www.gfz-potsdam.de).